US, 1974, 100 minutes, Colour. Bill Bixby, Susan Clark, Don Knotts, Tim Conway, David Wayne, Slim Pickens. 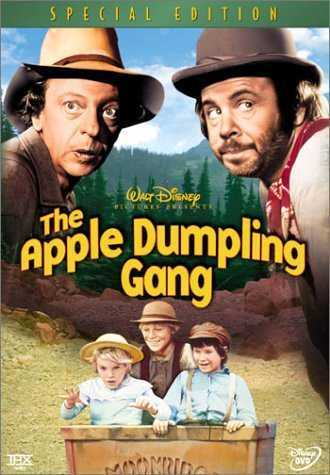 The Apple Dumpling Gang is vintage '70s Disney material - children, the west, a nice leading lady, a father who has to take responsibilities, comic crooks including Don Knotts. It is popular television material but presented most entertainingly Disney style. 1. How enjoyable a Disney film? Comment on its qualities as a product of the Disney studios: entertainment, the western genre, family film? What traditional values are presented in this kind of Disney film? 2. Response to the coy title? Was this the right kind of treatment? It was well reviewed by critics. Why? The entertainment value and strengths in plot and characterisation? 3. Its impact on an adult audience, on children? 4. The build-up of the western setting, presuppositions of audiences about westerns, the atmosphere of a robbery? How well did the film use the western conventions? 5. How attractive were the children? Their role as the Apple Dumpling Gang? The types that they represented? The fact that they were orphans and abandoned? The devotion of the people, the greed of the people in getting their wealth? 6. How engaging a hero for this kind of film was Russell Donovan? As a gambler, a man of the west, the likable characteristics of his personality, tricked into having the children, his ability and inability to cope with them, h-is reliance on Dusty, his hostility towards her? The fact that they all survived, especially when they were attacked by people for their wealth? The significance of their marriage, protection turning into love? How real a character, audiences identifying with him? 7. How attractive a heroine was Dusty? Her appearance, riding the coach, relationship with her father, carrying on his work? Her toughness, yet her tenderness? Her attitudes towards the children? The transformation into womanliness? Her motives for marrying, transformed into love? Was she a credible heroine? 8. How vividly was the town itself presented in its appearance, the familiar aspects of a western town: the bank, gamblers, the shops, the various people, the sheriff etc.? 9. The comedy contribution of Amos and Theodore? Comic types, the incidents in which they were involved, as part of the Stillwell Gang, thwarting the crooks, their sharing with the family at the end? 10. Comment on the 'baddies' of the film: the guardian, the Stillwell Gang and the comic way in which they were presented, Stillwell robbing the bank, the gunfight? The blowing up of the bank? 11. The satire on the Stillwell Gang and the western conventions of villains? The children confronting them? 12. How well did the film blend western action and comedy enjoyment?